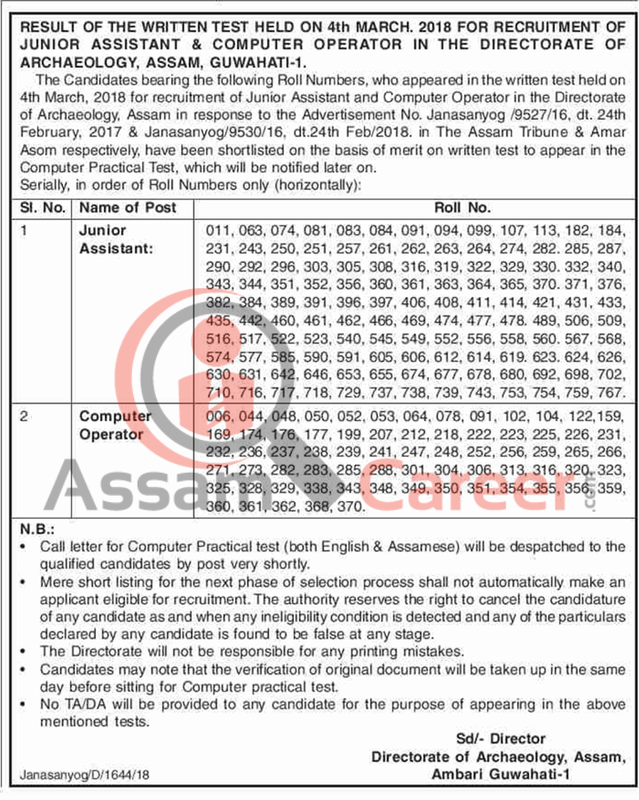 The Candidates bearing the following Roll Numbers, who appeared in the written test held an 4th March, 2018 for recruitment of Junior Assistant and Computer Operator in the Directorate of Archaeology, Assam in response to the Advertisement No. Janasanyog /9527/16. dt. 24th February, 2017 & Janasanyog/9530/16, dt.24th Feb/2018 in The Assam Tribune & Amer Asom respectively, have been shortlisted on the basis at merit on written test to appear in the Computer Practical Test, which will be notified later on. Roll No: 011, 063, 074, 081, 083, 084, 091, 094, 099, 107, 113, 182, 184, 231, 243, 250, 251, 257,261, 262, 263, 264, 274, 282. 285, 287, 290, 292, 296, 303, 305, 308, 316, 319, 322, 329,330. 332, 340, 343, 344, 351, 352, 356, 360, 361, 363, 364, 365, 370. 371, 376, 382, 384,389, 391, 396, 397, 406, 408, 411, 414, 421, 431, 433, 435, 442, 460, 461, 462, 466, 469,474, 477, 478. 489, 506, 509, 516, 517, 522, 523, 540, 545, 549, 552, 556, 558, 560. 567,568, 574, 577, 585, 590, 591, 605, 606, 612, 614, 619. 623. 624, 626, 630, 631, 642, 646,653, 655, 674, 677, 678, 680, 692, 698, 702, 710, 716, 717, 718, 729, 737, 738, 739, 743,753, 754, 759, 767. Roll No: 006, 044, 048, 050, 052, 053, 064, 078, 091, 102, 104, 122,159, 169, 174, 176, 177, 199,207, 212, 218, 222, 223, 225, 226, 231, 232, 236, 237, 238, 239, 241, 247, 248, 252, 256,259, 265, 266, 271, 273, 282, 283, 285, 288, 301, 304, 306, 313, 316, 320, 323, 325, 328,329, 338, 343, 348, 349, 350, 351, 354, 355, 356, 359, 360, 361, 362, 368, 370. • Call letter for Computer Practical test (both English & Assamese) will be despatched to the qualified candidates by post very shortly. • Mere short listing for the next phase of selection process shall not automatically make an applicant eligible for recruitment. The authority reserves the right to cancel the candidature of any candidate as and when any ineligibility condition is detected and any of the particulars declared by any candidate is found to be false at any stage. • The Directorate will not be responsible for any printing mistakes. • Candidates may note that the verification of original document will be taken up in the same day before sitting for Computer practical test. • No TA/DA will be provided to any candidate for the purpose of appearing in the above mentioned tests.